Intermediate size general purpose Bench MPI testing machine having bed length of 300 to 7500 mm long. Delivers AC/HWDC/FWDC Magnetising current from 500 to 10000 Amps. Current, Flux and combined MPI technique selected by simple switch. 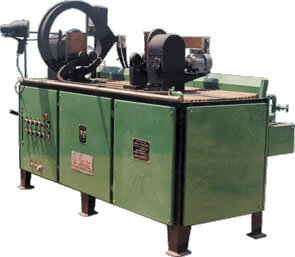 Bed coil for detection of circular cracks (optional). Infinite step-less current control by electronic circuit with automatic demagnetisation facility. Pneumatically operated head stock with and moving tail stock. Foldable black light hood with exhaust fan for inspection using Fluorescent Ink under darkness. Inbuilt magnetic ink reservoir with re-circulating pump & inking nozzle. Suitable for both surface and sub-surface cracks in steel components. For automobile, aeronautical, Railhead, Engineering units. For testing crankshafts /gears/ cam shafts/ components of automobiles. Forgings, castings and machined components can be tested for sampling and production line. Voltage supply 415 V AC 3 Phase.